The two-room installation The Laughing Monks presented two monks from Zen Buddhist iconography, Kanzan, a reclusive poet, and Jittoku, a temple dishwasher, interacting with each other in the context of selected artworks from the Henry Art Gallery’s permanent collection. 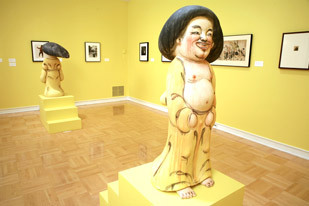 In one room Kanzan and Jittoku, with grimaced expressions, face away from each other on yellow platforms placed on opposite sides. On yellow walls are scenes of children by Nan Goldin, James McNeill Whistler, Edward Weston, and Helen Levitt. In the other room, Kanzan and Jittoku kneel on either side of an array of Japanese and Chinese functional ceramics from the collection. Their round bellies and bare chests protrude from robes, and the two appear to be enjoying a drinking party.